Forward a little more and I happened to catch the show again. Whilst the titles still seemed creepy I thought I would be brave and watch it through, and I was glad I did. I must have watched over episodes since but this particular episode sticks in my mind. It was about a man who had invented a device which let you hear the screams of plants as people picked them from the garden. I seem to recall the guy ended up either dying or going mad when he heard the scream of a big old oak tree being cut down. The stories of Tales of the Unexpected were much like this, short, one-off tales which took an interesting germ of an idea and fleshed it out into a 25 minute episode. Most of the stories had a very dark streak to them, although they were often quite funny too, and pretty much all of them ended with some kind of twist which completely changed how you expected the story to end. The show ran from 1979 until 1988, initially composed solely of stories by Dahl himself. He even introduced the stories sat in a big high backed chair with his trademark writing tray perched across his lap. Later series saw stories being written by various different authors and eventually Road Dahl stopped introducing the stories as well. 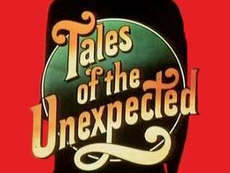 Tales of the Unexpected is one of those programmes that a lot of people will fondly remember for years to come, though possibly not so much for the stories as the creepy intro and music, which incidentally was composed by Ron Grainer, who was also responsible for two of my other favourite TV show themes, namely Doctor Who and The Prisoner. This entry is filed under TV - Miscellaneous	and was posted on October 20th, 2010. You can follow any responses to this entry through the RSS 2.0 feed. You can leave a response, or trackback from your own site. I had no idea Road Dahl had anything to do with Tales of the Unexpected, but I certainly remember watching the show many times! My favourite was the one where the man with a beard takes lots of Royal Jelly and turns into a bee. Also, Elaine Stritch as the woman who gets her husband returned to her as a cybernetic machine after his death. I loved the eyes!